The first time we overpaid, we were on a taxi ride back from Turk Telecom Stadium into Istanbul. The morning had gotten off to a rough start, not because we had stayed up drinking too much raki, the anise-flavored liquor Turks serve at any celebratory occasion, but because, as two early thirty-somethings ready to go to bed at a reasonable hour, we had taken sleeping pills that knocked us out more thoroughly than we were expecting. Waking up was hard. We walked as if through a particularly soupy fog, which also did happen to envelop Istanbul in a protective shroud throughout our stay. We found the taxi and its driver a few blocks from our hotel, and immediately liked him. He drove swervingly and quickly through the Istanbul traffic, surprisingly heavy for a Saturday morning. He spoke some English, but mostly communicated through various hand gestures, including, charmingly, kissing the palm of his hand and holding it to us whenever he thought something was good. When we explained that we were heading to the arena to pick up tickets for the soccer game that night, he kissed his hand and said, “Good! You have money! I have no money. I have four children! Ha, ha!” He kissed his hand again. We had chosen Istanbul in part because we had no children. More specifically, we had thought we would have one in February of the same year, but I miscarried that one, and then another, and we thought that a trip abroad would be just the thing. “I want to remember that I have a life outside of trying to be pregnant,” I told a friend, which was half true. The other truth was that I just wanted to get away, to outrun bad luck for a little while. The bad luck we encountered in Turkey was of another, more pedestrian kind. We overpaid for that taxi ride — it should have been no more than 60 lira, the hotel clerk told us. We paid 300. We did it again for a wine decanter, and a ride to a medieval monastery in a town on the border of Georgia and Russia, and, perhaps, for a beautiful rug that was sold to us by the father of the tour guide who took us on an ATV ride through Cappadocia, the land of tufas and cave hotels and church fathers who came up with the idea of the Trinity. He stroked the rug lovingly just before he sold it to us, and showed us a picture of him with the rug twenty years earlier. We would have paid whatever he asked. We had money, and no children. And it was safe, and besides, what did we have to worry about? A dog back home? We had no one relying on us, and the entire city unfolded before us like an open book, each neighborhood a chapter to read. 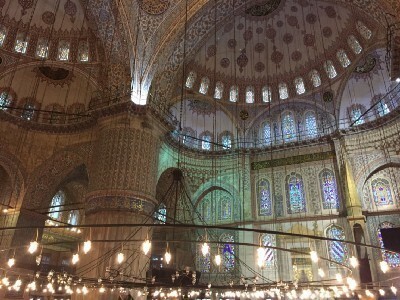 We walked through Besiktas and Karakoy and Sultanahmet, holding hands and ducking into stores and museums and mosques, buying tickets from the bored young men who wore official outfits. We encountered life outside of trying to be pregnant. We flew from Istanbul to Tbilisi, the most beautiful jewel of a city I have ever seen, and drove from there north to the Russian border where we stayed in the shadow of Mt. Kazbeg. We drove south, too, to the border of Azerbaijan where there is an ancient monastery, where saints lived in caves and some men still live, charging five lare for wooden crosses and guidebooks. I prayed and tried to forget what had been paining me, and tried to remember to be present, live in the moment, savor the time away, and so on. Savoring is not my strong suit. As an anxious person, being on vacation has always been a series of What’s next and Could this be better and This trip is almost over and I have not savored it enough. The prevailing wisdom that living in the moment is the best way to be is as attractive to me as a Bosphorus sunset, and as ephemeral. How do you leave the past behind — and, more to the point, how do you live a life in which attendance to the future is not the main thing? What I am inclined to, biologically or temperamentally or otherwise, is to ensure that harm will come my way as little as possible. Pain reduction. Self-protection. Do we travel to live on other worlds for a little while? Perhaps we travel to suspend time, as one can only in a hotel in a foreign city, where the time of day is as unpredictable as what is around the next unknown corner, where nothing, not even my own things, are familiar. I never forgot, not even for a day, what I traveled to escape from. For what it’s worth. I saw children skiing in the Caucuses, running around quiet fountains in Istanbul, riding bikes in Tbilisi. They were everywhere, and we had money to travel to see them, but no children.